Dawn of the Rising Sun Scenarios, In February 1904, Russia had the world’s third largest fleet, while that of Japan’s was ranked fourth. By September 1905, Japan had become number three and Russia had fallen below the top ten. 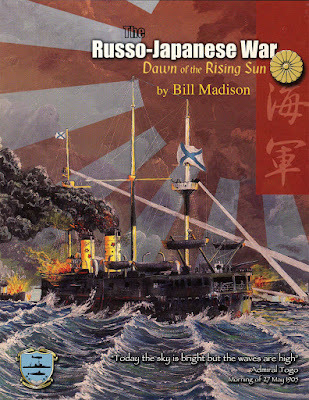 Dawn of the Rising Sun contains nineteen scenarios for the Admiralty Trilogy’s Dawn of the Battleship game, covering all the major surface engagements of the Russo-Japanese War, which led to this stunning reversal of fortunes. Dawn of the Rising Sun is used with Dawn of the Battleship rules, which are part of the Admiralty Trilogy system, making them easy to follow for experienced gamers and novices alike. Tactical turns represent three minutes, with intermediate turns (for extended maneuvering) representing 30 minutes. Gun hit chances are based on a combination of factors such as visibility, range, target size, number of rounds fired at the target, and the speed of the firing and target platforms. In addition to well-known battles such as Port Arthur, Yellow Sea, and the Tsushima Strait, several smaller battles have been included. The scenario book is full of original after action reports as well as helpful sidebars on a wide range of topics. Each scenario has its own map, showing the disposition of forces. The separate annex booklet includes all the ships that were involved, including information on the guns, torpedoes, and fire control of the era, making it a valuable reference in itself. Players purchasing the Dawn of the Rising Sun scenario booklet will also need the 28-page annex booklet ($4.00), which provides information on all the ships and weapons needed to play the scenarios.